What I found there were Garden's extremely short, but very complete stories. They ran the gamut from romantic thrillers to paranormal horrors to simple everyday life themes. What made her stories special to me were their ability to make me feel a certain emotion - be it anger, love, hatred, jealousy, fear - in a concentrated form. As I read her stories I felt I was eating the literary equivalent of a Whitman's Sampler. And just like with that treasured box of assorted chocolates, I found I couldn't stop at just one story. I kept coming back for more. Quietly at first, a little embarrassed, because some of the stories had romantic themes that produced those concentrated feelings and it was hard admitting that a big, burly middle-aged man like myself could enjoy stories like that. But I was hooked on all of them (there wasn't a smooshed up green piece in the whole box, to continue with the sampler analogy) and I needed to tell someone, so I told Garden and I became a follower of her blog. Eventually that wasn't enough, though. I broke down and subscribed to Wallpaper Dreams, so each sweet nugget of a story could be delivered to me via email fresh off the presses, so to speak. Just when I felt these gems weren't coming fast enough, Garden announced her first book. 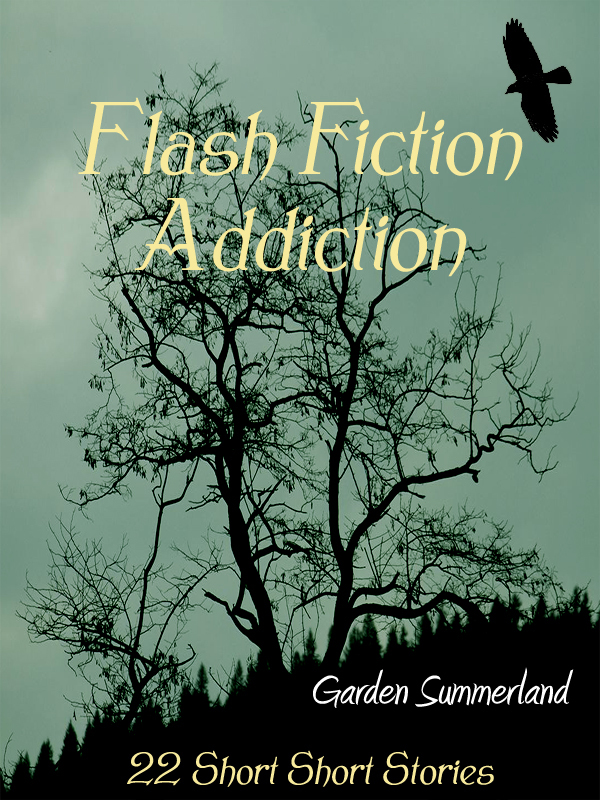 Aptly named, Flash Fiction Addiction is a collection of 22 short short stories; some from her blog and some new ones. It was so popular she quickly released a second collection. After reading this first collection, I hope there's a third, fourth, fifth, etc. because, even with 22 stories, the first book only runs 58 pages and, being an addict, I went right through it. I think for the second collection I may have to ration the stories to make it last longer. I asked Garden if she could tell me more about flash fiction in general. "Apparently, it is not a definitive style as yet as far as the industry is concerned." She explained, "there are so many different 'definitions' and not really one set standard for flash fiction. Some people consider it to be under 300 words and the maximum word count that I have ever seen is under 1000 words, so that's what I keep it at." After researching a few sites on my own, it's clear to see there is an active debate on word count in flash fiction, but everyone seems to agree on one thing: it is a complete short story containing an exposition, climax and resolution. The rising and falling actions just move extremely quickly. There's a definite challenge and an art to flash fiction. You only have so many words to tell a vivid, compelling story, so you need to choose your words more carefully. It's that challenge that continues to draw Garden. If you pick up one of her books or visit her blog, you'll see she has more than met that challenge. In fact, she's mastered it. "I would love to say that Sister Sugar is my main focus right now, but I cannot fight my ties to flash fiction." She continues to dedicate her blog to flash fiction and, "due to the unexpected popularity of the first two collections, I may find myself writing a Volume III of Flash Fiction Addiction before all is said and done. Additionally, one day, you just may find my collections in print! This is one reader waiting excitedly for his next fix. Are you ready for a compilation of entertaining short stories that range in content and depth? Look no further than Flash Fiction Addiction: 22 Short Short Stories, Volume II by Garden Summerland. Whether you’re a fan of romance, paranormal, blood sucking vampires or tragedy you will find something to enjoy in this grouping. Miss Summerland is a joy to read and for those of us who like true flash fiction, she delivers – unleashing timely twists and revelations, some at the last minute while others are slip-stitched throughout, securing the story together succinctly by the end. I’ve always been a fan of Alfred Hitchcock, including ‘Alfred Hitchcock Presents’ that premiered in 1955. This collection of Miss Summerland’s stories hearkens unto these Hitchcockian themes but with a modern approach. One of her strengths is the ability to build a solid story with memorable characters in such short works – not easy. Some standout examples are The Tattoo, Displaced and A Golden Carriage. There are others, but these three especially show the depth of character she is able to imbue to her works of flash fiction.